Louis B Culpepper, White, Single, born 1917 in Tennessee, residing in Polk Co., Tennessee, enlisted as a Private in the US Army on 17 Apr 1942 in Fort Oglethorpe, Georgia. Obituary ofJohn Bryan Culpepper (#6245), published 27 May 2009. E-mail written Jun 2013 to Warren Culpepper from Juan Jose Culpepper (#64199), e-mail address. E-mail written Jul 2006 to Warren L. Culpepper from Kelly Denise Culpepper Lee (#6248), e-mail address (Aug 2011). Find A Grave Memorial# 10155917. E-mail written 2001 to Warren L. Culpepper from Regina Tullock. 11 Jul 1994, Page 7C. Obituary. Mr. Carl Howard Culpepper, Sr., 69, a native of Etowah, TN who had lived in Augusta for 26 years, died 10 Jul 1994 at University Hospital. Interment 12 Jul 1994 at Sunset Memory Gardens, Aiken. He had retired from the Army and was a veteran of WW-II. Survivors include his wife, Eloise Hudson Culpepper; a son, Carl Howard Culpepper, Jr., of New Ellenton, SC; his mother, Maude Coleman Culpepper of Chattanooga, TN; a brother, James Culpepper of Dulane, TN; a sister, Claudette Whiteland of Chattanooga; and a grandchild. Carl H. Culpepper, d. 10 Jul 1994 at 69 years in Richmond Co., GA; Res. in Appling Co., GA.
James E Culpepper, White, Single, born 1923 in Tennessee, residing in McMinn Co., Tennessee, enlisted as a Private in the US Army on 15 Jun 1943 in Fort Oglethorpe, Georgia. (Leslie is shown as married, but his wife is not enumerated in the HH). 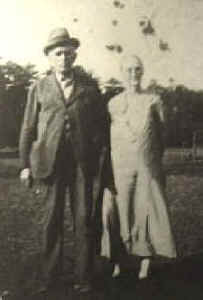 Leslie Culpepper and Miss Mary Elizabeth Thirkeld on 22 Sep 1923 in Gordon Co., GA, Book E-126.